I love it when God wants me to learn a lesson. Monday was starting out as a real Monday. One of those Mondayest of Mondays kind of Monday. Everyone woke up cranky. No one had slept well. No one was happy with anything. No one wanted to go to work or to school. We sniped and griped and whined. The drive was awful. The weather was dreary. Everything about the day was just... monday. Work wasn't proving to be any fun. The day started with a meeting that announced more changes - positive ones, potentially - but changes are always a bit wearing. Work load, end of year, dismal, dreary, blah. A day of meetings and busy schedule and a day where I needed to help pick up, pack up, and deliver our company's donations to a local women's housing group. I co-lead a women's leadership group at work. And our primary outreach focus is on a place that provides women who are homeless due to domestic violence a place to live that is safe for them and their kids. They also receive education assistance, child care assistance, job placement, etc. These families live in this place for up to 2 years until they can thrive and sustain on their own. It's a really great organization. This year, our company decided that our women's leadership group would "drive the train" on the company's community outreach efforts for the holiday. So we divided the 2 buildings into teams, each team received a themed basket with a list of ideas under that theme (kitchen, bedroom, transportation, pantry, etc) and a deadline by which to have donations brought in. We also asked for volunteers to help on the day we would be picking up and loading cars and driving the donations to the organization. We gathered each group's donations. Some were big. Large boxes, bags full of stuff. Some were small. We walked all over 2 buildings - offices and warehouses and production groups. We hauled load after load after load to our 2 vehicles. In the rain. And the wind. We had the wind "steal" pillows and lighter items a few times. It was hard and kind of miserable work. And we didn't have help. We had people stand and watch as we struggled with doors and weather and boxes and bags. When we arrived with our 2 carloads of brand new household items to donate to an organization who creates a home for families who have nothing and the women who helped us carry in the donations gushed over how amazing all of this was - that this was far beyond their expectation... my partner in the job felt good. "This is why we did this." But I still didn't feel good. It was still the Mondayest of Mondays. Why wasn't I feeling good like my co-worker? I still just felt... exhausted, worn, troubled. It was a lack of coming-togetherness that had felt so off all day long. My family woke up not being together. We were each focused on individual wants or complaints. Same thing at work - everyone is focused on their own struggles. And the same thing with the donation drive and picking up and loading efforts. Everyone just wants to focus on their own thing and not see anyone else's needs or wants. It was that realization that filled me with joy. I get my kicks by seeing a need and filling it if I possibly can. I am very grateful to know other people who are also wired this same way. And most days, my family seeks to take care of each other with this same motivation. If you're cold and I have a sweater, I will give it to you. If you're hungry and I have a sandwich, I will give it to you. If you're struggling to get a load of stuff into your car, I will stop and help you. Not everyone sees the world this way. Not everyone acknowledges the reality of the experiences of other people. But for me, that's what humanity is. We're all the same, we all have struggles. And when we see someone who is really just like us and they are struggling and we have some way of making it better or fixing the problem or at least showing them that they aren't alone... that's where I find joy. It doesn't mean I can fix every problem. It doesn't mean I have any answers. It doesn't mean I have unlimited resources. It just means that I pay attention and when I see a need that I can address, I don't turn away. Being on the receiving end of people turning away was just setting me up for understanding where my joy comes from. My joy comes not just from me being able to help. My joy comes in seeing others feel the same way. My joy comes when my daughter creates joy for another person by making them feel special. My joy comes when someone reaches out to my son to bring him a teensy bit out of his shy shell. 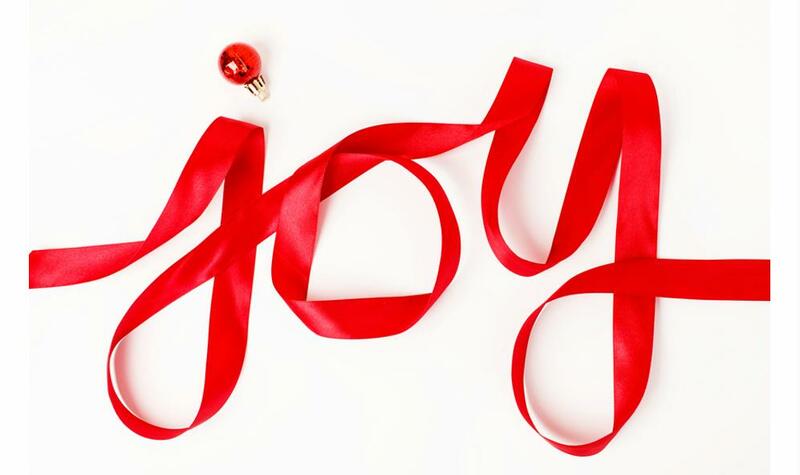 My joy comes when someone stops at an accident scene, someone holds a door, someone puts away an overwhelmed mom's grocery cart, someone takes meals to the homeless, someone spends time with someone who is lonely. My joy comes from knowing that compassion and love really do exist in the world. And that's a pretty good lesson to learn. Don't miss the start of the video - Bandit wants to say HEH-RO! And Happy HOWL-idays to you! I love the holiday season — the cold weather, the yummy food, and of course, all of the festivities! And what I wish I could do is spoil our Bandito with lots of fun toys... but he's a dog who only loves treats. I am happy to buy toys to donate to our favorite rescue groups in his name, though. It turns out that I'm not the only dog mama to spoil her pup during this time of year. That's why I love this super cute website called TheNosePrint.com from Big Heart Pet Brands (the makers of Milk-Bone, Pup-Peroni, Canine Carry Outs, and Milo's Kitchen). They really know how to celebrate the holidays with your pup! My favorite was the Ho-Ho-Howliday Treat Bag - it's mostly easy enough that even not-crafty-me could do it. And it's a fun and easy gift idea for my favorite neighborhood doggie friends! I'm also loving the homemade paw-print ornament. I've seen these with children's handprints before. Why not have your fur child make an ornament too? Other great homemade doggy gifts include a treat bouquet, a sweet treat jar, and a ho-ho-howliday treat bag. The NosePrint.com also asked 3,000 Americans about their dog-related holiday habits, including whether their dog is involved in gift-giving, stocking-stuffing, Christmas sweater-wearing, and other holiday traditions. What they found is that Americans really LOVE their pets. For instance, did you know 71% of dog parents give gifts to their pups? 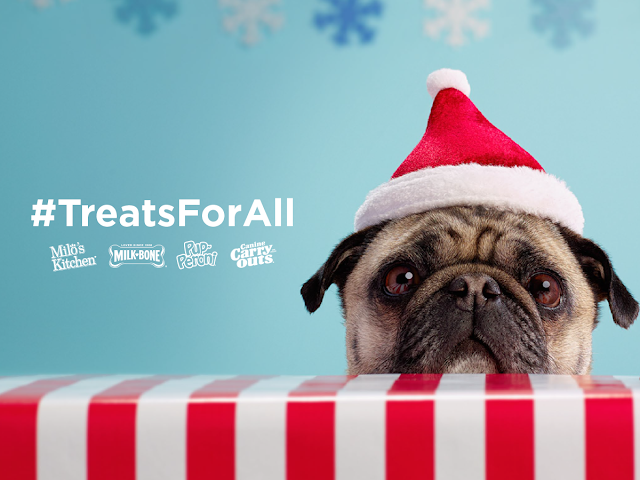 Have you completed your Christmas doggy shopping yet? We get a little bummed because Bandit is such a low maintenance dog - he likes cookies and treats but he doesn't care at all about toys! We'd love to spoil him with balls and stuffed animals but he just ignores our attempts. 1. 48% of dog parents hang a Christmas stocking for their dog. 2. 43% of dog parents include a dog in a photo for a family holiday card. 3. 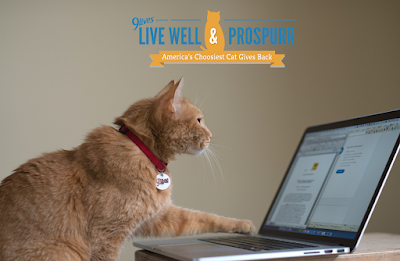 32% post photos of their dog on social media with a holiday message. 4. 29% dress up their dog in a holiday-themed costume or outfit. 5. 22% make or buy dog-themed holiday decorations. Finally, want to know which states have the most spoiled pups? Apparently, it's good to be a dog in the New York tri-state area. You can find the complete rankings of all 50 states at www.TheNosePrint.com. One final thing: The folks at TheNosePrint.com have generously offered to give away a FREE Christmas doggy care package filled with some of the most delicious stocking stuffer treats for your pup. To be entered to win the care package, just visit this DIY decor article on TheNosePrint.com and tell me in the comments below which DIY doggy decor project that you think your family would love best. I'll choose the winner on Dec 18! This is a sponsored post - because I love my pooch and I want you to have a chance to win and I know some doggie parents who love to do fun and crafty things for their Fidos. Hoooooowl! In case you couldn't guess, I'm purr-ty much an expert when it comes to eating, and that's the subject of my next venture. As you know, the holidays are 'prime eating time' and I want you to be able to chow down like a pro. In it, you'll learn how to eat like the true foodie you were meant to be. 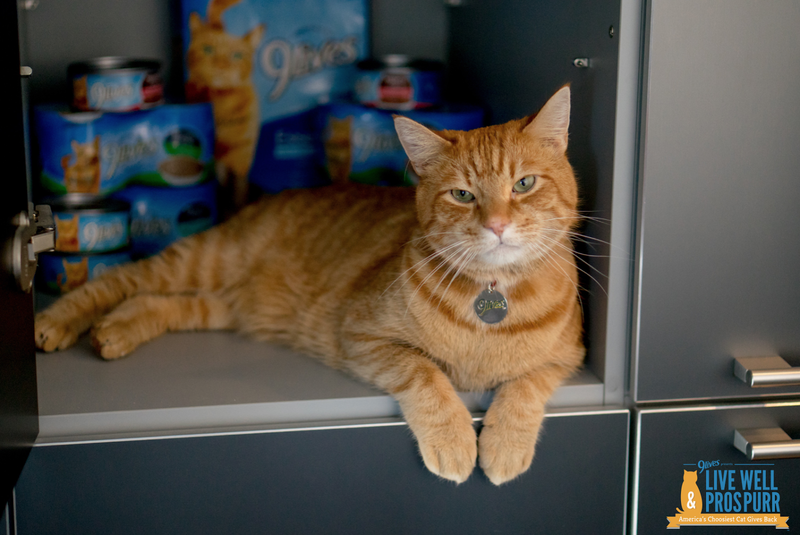 On my site Prospurr.9Lives.com, you can also enter to win a customized drivable cooler, so if you do have to eat on the go, you can do so in style. And don't forget to tweet #MorrisFeeds to give hungry kitties the gift of a tasty, hearty 9Lives meal. This is a sponsored post. But that contest is real - go check it out and enter before Dec 18!! I've had disturbing stories in my newsfeed, on the radio, on Twitter lately. About Muslim women being taunted and harassed in public places and no one standing up for them. Or standing up but not until after a lot of hate had been spewed. It's heartbreaking. It's infuriating. It's disgraceful. It's shouldn't be any surprise that I am one who is going to stand side by side with my Muslim sisters and brothers, just as I would with my Jewish or Mormon or Atheist or Humanist or Agnostic or Catholic or... you get the idea. Today, I was doing my shopping at Target. I hadn't gotten enough sleep the night before. I'd had a very busy day. I was having some health stuff that was wearing me out. I was run down from my kids having difficult moments. I didn't pay attention to the people around me. I came down an aisle and there was a Muslim mom and her teen daughter. Talking about cookies. The teen was very joyful and chipper. A young white family came down the aisle - mom, dad, and an adorable little baby. The teen began to oooh and aaaah over how adorable the baby was. The young mom smiled and laughed. The dad, wearing the baby, also smiled. And everyone kept on walking and shopping. I encountered these 2 in a few more aisles. The same thing kept happening. Normal interactions, smiles, shopping. I head up front with my cart. The lane with the shortest line has a Muslim cashier. I step up to it. And so do several others - I'm not fast enough. Others beat me to the shortest line. The one being rung by the Muslim cashier. Which no one cared about - they just wanted their groceries rung up. I noticed another employee in a head scarf. And I noticed no one else seemed to notice. I encountered 4 Muslim women at Target. And I didn't encounter hate or ignorance. Doesn't mean people weren't thinking dumb stuff. But it does give me hope that maybe my little community is the greater example... my little suburb might just be what's normal. Maybe not. But maybe if a simple Sunday afternoon in a grocery store in a basic little suburb can be any sort of example, maybe peace really is possible. But somehow, those peaceful moments and examples somehow have to speak louder than the stories of hate. Somehow, those simple moments have to inspire people to stand up against hate when they do see it happen. Because my simple and peaceful and basic Sunday trip to the grocery store should be what anyone experiences in any everyday part of their lives. In a little city or big, in a rural area or urban, in a school or workplace. Today, I went to the grocery store. And I encountered Muslims. And most likely Jews and Mormons. And Atheists. And moms and dads. And lesbians and straight people. And brown people and cream colored people. And women and men and children. And they were all just people. As we all are. I have memories from childhood about grapefruit. We lived with my grandparents for a couple of years. Which makes for an awesome opportunity for grandma to spoil her only grandchild. Many nights, I'd go to bed and then try to get out of bedtime by saying I was hungry. My mom would send me back to bed. And then... my grandma would sneak upstairs with a snack for me. Often, it was half a grapefruit, cut in half, sprinkled with sugar, and a cherry in the middle. As an adult, I still love grapefruit. I'm not so much a fan of the "sprinkled with sugar" part - I really love to peel the fruit and eat the segments. Although, who doesn't love the old experience of cutting it in half, eating the segments (with a special grapefruit spoon if you were so lucky), and then squeezing out spoonfuls of grapefruit juice. Mmmm! So when I was approached about blogging about grapefruit - I was all in. "Wonderful Sweet Scarletts – a new brand of Texas Red Grapefruits – launched nationwide last year and will change the way you think about grapefruits! From the people who brought you Wonderful Pistachios, POM Wonderful and Wonderful Halos, Wonderful Sweet Scarletts Texas Red Grapefruits are so sweet, you won’t even need to add sugar! The Texas climate yields the sweetest premium red grapefruits around. Not only is our grapefruit sweet, but half a grapefruit is only 60 calories and provides 100% of the recommended daily value of Vitamin C."
I'm a fan of Wonderful products already. So to find out they're adding grapefruit? I have to admit that I got a little excited. Jumped around a bit as if I'd squirted grapefruit juice in my eye (all grapefruit fans have done this, trust me). Now I've always enjoyed grapefruit just by itself. But Wonderful Sweet Scarletts Texas Red Grapefruit sent me some recipes created by Haylie Duff (actress, author and host of Cooking Channel’s The Real Girl’s Kitchen)... I might have drooled a little bit. 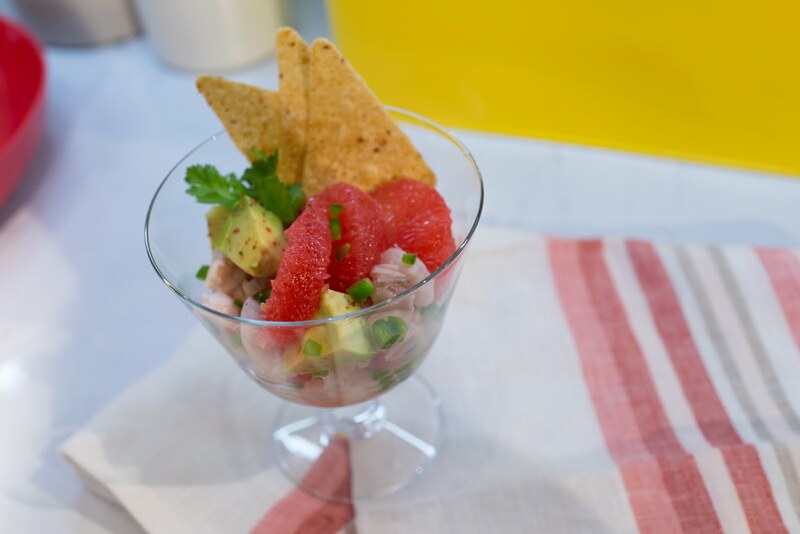 There is a recipe for Wonderful Sweet Scarletts Grapefruit and Red Snapper Ceviche. I love ceviche. And this recipe has all the things I love - ponzu, lime, jalapeno, grapefruit. I'm simply going to be forced to make some! Best of all - Wonderful Sweet Scarletts Texas Red Grapefruit wants to offer you a chance to win a basket celebrating grapefruit!! "We would like to offer a gift basket that I think your readers would love that includes our Wonderful Sweet Scarletts Texas Red Grapefruit, recipe cards featuring our grapefruit, a grapefruit spoon, circular cutting board, grapefruit bowl, and apron." Ya'll, I want one for me! But this giveaway is for YOU! Enter via the Rafflecopter below! Winner will be selected on Monday, Dec 14. 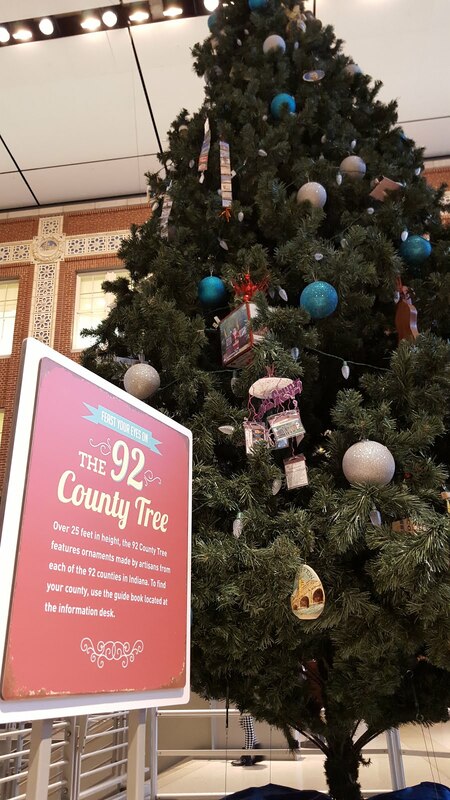 One of my favorite places to visit each holiday season is the Indiana State Museum. There are lots of fun places to visit around Indianapolis this time of year - Conner Prairie, the Zoo, Eiteljorg, Polar Express, the Children's Museum - that it can be hard to choose what to do. 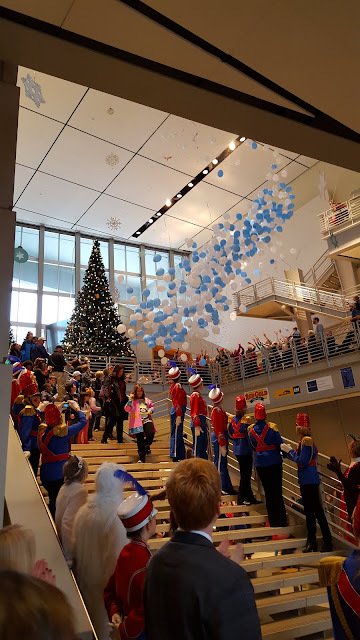 Here is why we love Celebration Crossing at the Indiana State Museum - it isn't chaos. 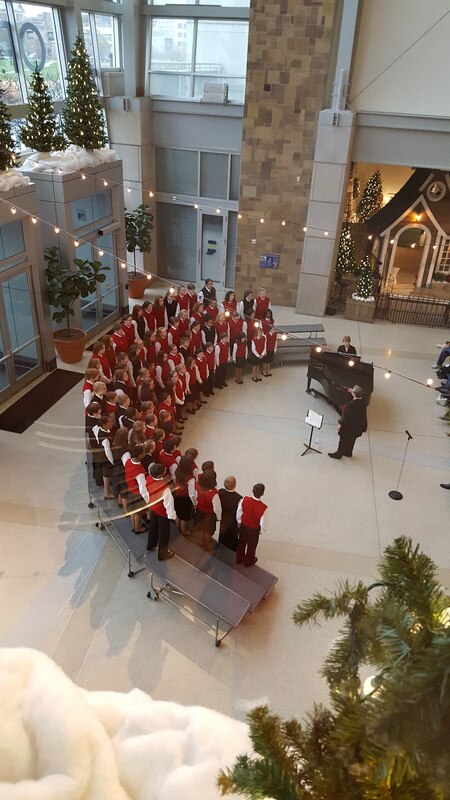 Celebration Crossing brings a lot of the joyful simplicity of the holiday to the State Museum. 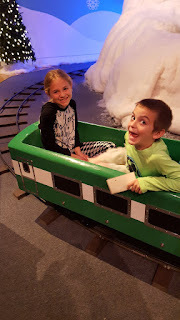 We enjoy visiting the Indiana State Museum once or twice per year anyway. Teagan loves the natural history side of things. This year, we even became museum members. 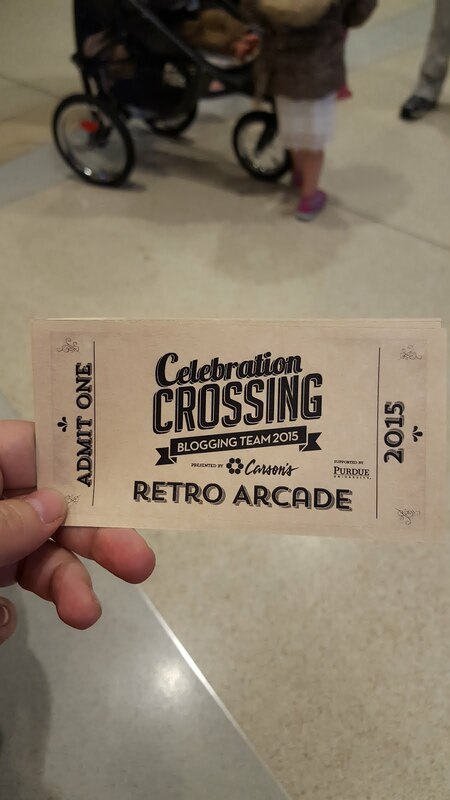 But Celebration Crossing is special. There is a throwback to a simpler time - there are recreations of store windows, for example. 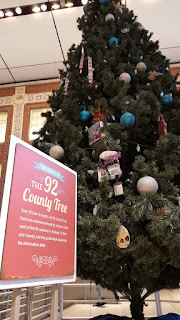 I love that big department stores used to be a main commerce point in the downtown areas and that those stores would get attention and be part of a tradition as they dressed up their store windows for the holidays. That just doesn't really happen anymore. I love that you can visit a recreation of the L.S. Ayres tea room and my kids can experience a "fancy" lunch that is still kid friendly. I love that the offerings of Celebration Crossing aren't loud or flashy. This year, there is a loud and flashy but really fun new thing. It costs a little extra but if you grew up enjoying an arcade or old video games at your local pizza place... you won't want to miss the Pop Up Retro Arcade. 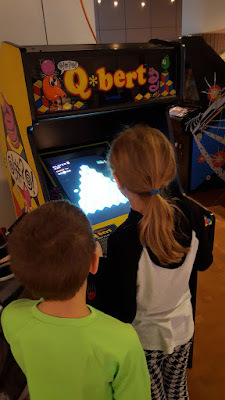 We played Pac Man, Q-Bert, Asteroids, and more. After a few video games, we headed downstairs for Santa's big arrival - by helicopter!! And there is a big balloon drop when he comes inside. Toy soldiers line up to announce his arrival. 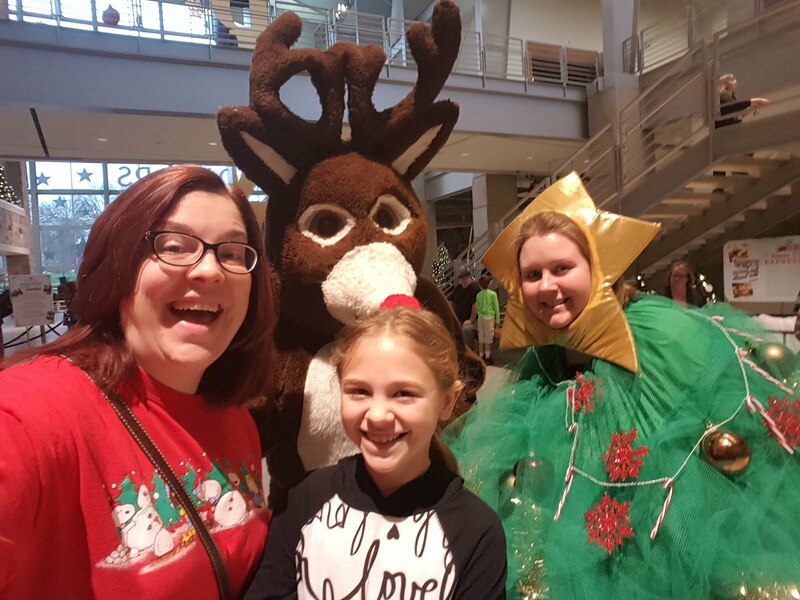 Raggedy Ann is there, reindeer, Xmas trees, and all kinds of fun characters. 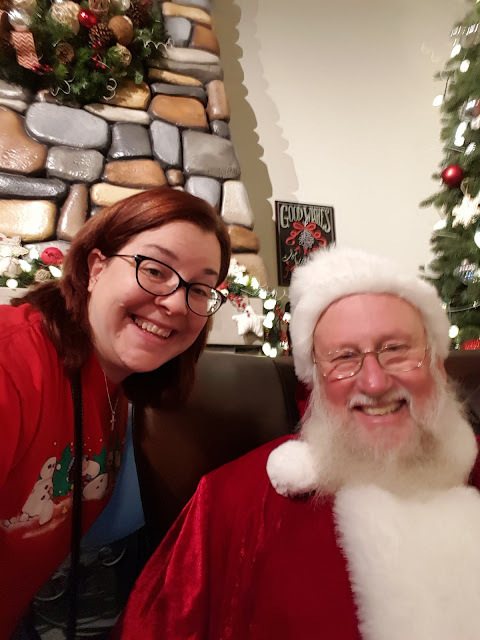 Then it was time to see Santa! The Santa at Celebration Crossing is one of our favorite. We've been coming to see him since 2008. 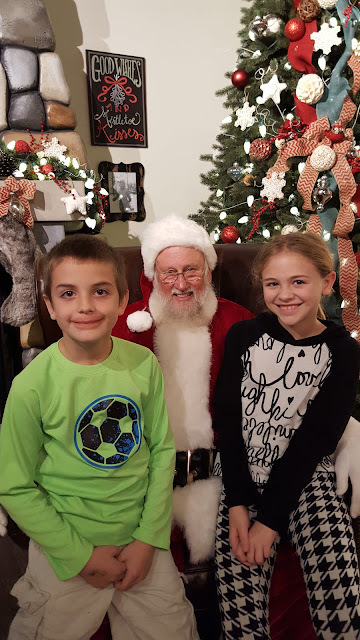 Last year, he helped us create Santa magic for Teagan as she entered the first real stages of Santa Denial. 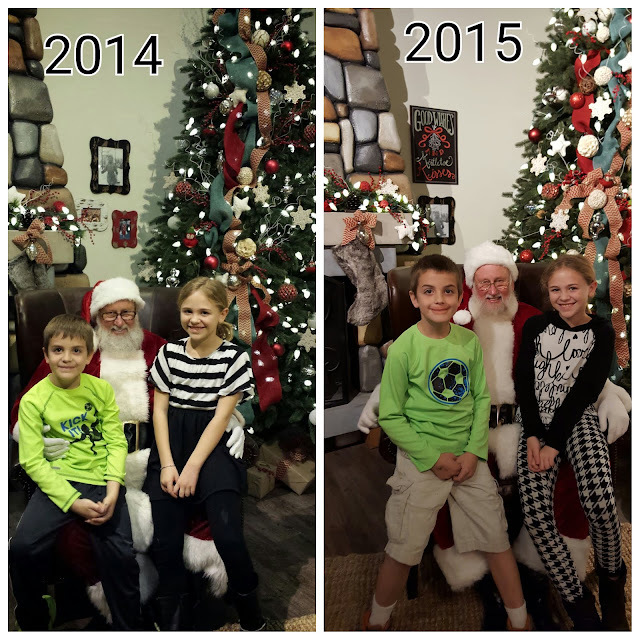 But here is my favorite thing from our visit to Santa this year - check out the side by side pic of this year compared to last year. I couldn't have done that intentionally if I tried - I'm never tha torganized. I gues each kid really has their own style. But hands the same, sitting the same way, clothing so similar... freaky! Another Christmas miracle, right? 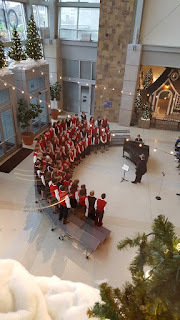 Other favorites at Celebration Crossing are the variety of local talent on display (various choirs and groups come at different times to share holiday cheer and sounds), the 92 County Tree, and riding the L.S. Ayres train! Another fun find this year was the cafe at the Indiana State Museum. Definitely worth a stop. The food is fresh and interesting and more varied than most! And it was tasty! 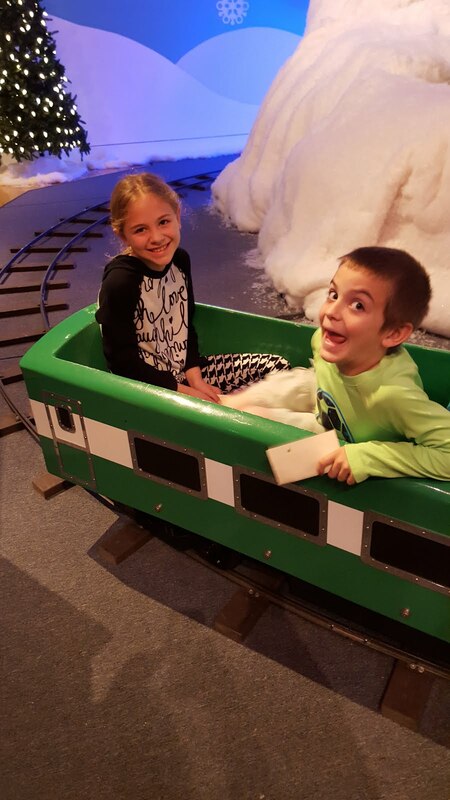 Celebration Crossing at the Indiana State Museum will always be top of our list for our family's Christmas traditions! Don't try to do it all. Do what matters most. Every year, Advent has been a season of joy and excitement for me. I think because I just mash it up as a part of Christmas. But this year, it's loud and clear that Advent is a separate season. Yes, Advent is about anticipating the arrival of a Savior. But in today's world, we've turned that into a hurried and rushed time of the year where all of the focus is on the anticipation and none of it is on the waiting. At church this past week, a lot of emphasis was placed on the idea of simplifying things, of making this season less about all the things we have to do and more about all the things we truly need to do. So I've been digging. Deep inside myself. In my digging, I was first pointed towards the book of Hebrews. Chapter 11 is all about people in the Old Testament who had great faith in God and how that faith played out in their lives. Chapter 12 goes on to say 3 main things - rely on your faith, stay focused on Christ, and don't be afraid of God's corrections. Chapter 13 then begins by saying - Don't forget about love. The next thing that came up was a daily devotional I receive that has a small bit of C.S. Lewis' writing. Yesterday, it was from "Mere Christianity" and the part that stood out to me was that we can't just read the words of Christ or study His life and then attempt to follow it. 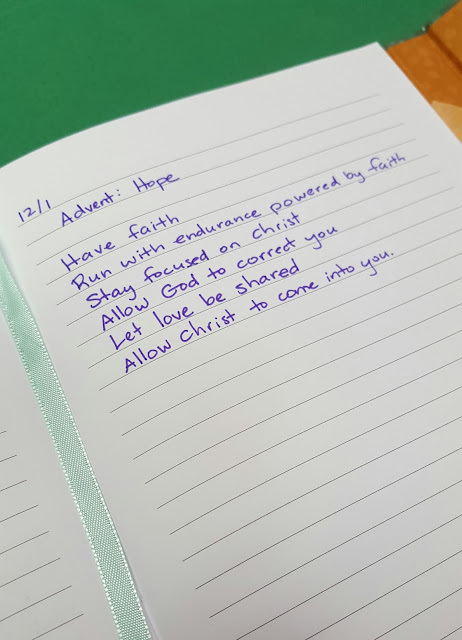 Instead, we should recognize that Christ is with us and that we can open ourselves up so that, little by little, Christ will come into us and live through us. And the next thing that was tossed into my path was the work of Gungor and The Liturgists and their offering for Advent and the Christmas season (Oh Light). A spoken word piece by Amena Brown that speaks to the brokenness all around us. A meditation by Science Mike and Michael Gungor that took me on a journey through time and space. And here is where I ended up, here is where I focus in this first week of Advent. There has always been and will always be pain and suffering and death and trauma and harm and confusion in the world. Because the Light of Our Creator is within each of us. And from that Light, we have love and joy and healing and peace. My prayers this week are that those who feel hopeless will see a spark of light and they will find HOPE. That those who are consumed by anger, those who cause harm, those who feel lost or worthless, those who feel unloved, those who are mourning, those who weep... all of us who have and will and are experiencing the sufferings of living will see even a glimmer of HOPE and cling to it. Christ is coming. Advent prepares us for His coming. One candle this week, a candle for HOPE. Even if that single light seems very far away. Know that HOPE is coming. If I can pray for you this week, please let me know. You can comment here on the blog, you can message me, email me, text me. You can share details or just raise your hand silently. Let's join our prayers together.